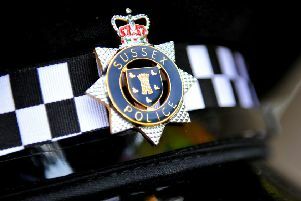 The Horsham district has been struck by a spate of ram raids with tens of thousands of pounds stolen from several village businesses. Three ATMs have been ripped from walls in villages across the district since the spring, destroying parts of shops and forcing a bank to close. Billingshurst Sainsbury’s saw its store badly damaged as thieves used a stolen JCB to remove a cash point from a wall in the early hours of this morning (October 12). Last month a stolen forklift was used to pull an ATM out of the wall of a Co-op store in Rudgwick. In April thieves left a trail of destruction as an ATM containing thousands of pounds was hauled out of the wall of Barclays Bank in Henfield. It has not been confirmed by police whether these incidents are related and officers said it will ‘form part of the investigation’. Police investigate ram raid at Barclays in Henfield in April.